This ebook will offer you and your family most of the information you will need to make informed choices about cancer care. This 2,500 page cancer compendium will offer you and your family most of the information you will need to make informed choices about cancer care. This compendium will teach you about natural oncology. It is a medical book, in understandable language, about a new form of medicine called Natural Allopathic Medicine. 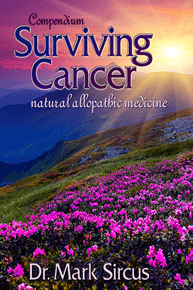 The Natural Allopathic protocol for cancer is aggressive in penetrating down into the deepest roots of physiology and pathology of cancer but it does so gently by using safe, nurturing substances. The exciting part of this method is that it is easy to learn and practice at home. Anyone can start implementing it even while being treated by other approaches. This compendium contains a turnkey cancer treatment program that can be implemented by any patient, practitioner, clinic, spa or hospital. It is like an army field hospital set-up guide for patients who want to treat themselves in the comfort of their own home. Natural Allopathic protocol offers bulletproof information about basic treatment options that should be administered NO MATTER WHAT! If you want to continue living and dwelling among your loved ones there are certain things you have to do that regular doctors do not focus on. Hydration, which is the most basic contributor to inflammation and cancer, or magnesium deficiencies are issues patients must face even if they elect to do radiation and chemotherapy. This compendium addresses not only the hard issues of medicine and taking care of a sick body but also addresses the emotional, mental, spiritual and sexual areas of our nature, which one way or another come into play when successfully treating cancer. Surviving Cancer will give you power over your medical situation. The more knowledge and information you have at your fingertips, the more secure and heartened you will feel. The first few hundred pages will change the way you look at cancer and its treatment. And the thousand or two pages that follow is a goldmine of well-organized information and research married with decades of clinical experience, not just my own but other practitioners of the healing arts and of allopathic medicine. Many patients are stunned by the number of doctors and specialists they need to consult, with no one really being in charge. Patients do not have a number or someone to communicate with if they have any questions. There is rarely a medical expert who’s in charge of your follow-up care and no counselor to help you weigh the advice of any one or group of doctors who are certain they are right about what you need to do. There is no plan given to you for the next six months after you have been "successfully" treated and no guidance to your family or anyone about how to avoid getting cancer in the first place. Would be nice to have some hints about strategies to avoid cancer reoccurrences and what we could be doing before our “nightmarish” cancer treatments are administered and what we need to do to survive the toxic fare of orthodox oncologists. Most people realize a patchwork of frustrating care with no one to look to as a champion or trusted figure. In the old days, the general practitioner held down the fort for a person and their family. Most people do not get straight answers out of their oncologists and they never will. How long does the average person with cancer live under the care of mainstream oncologists? What is my likelihood of a cure? If I cannot be cured, will I live longer with treatment? How much longer? Will this care directly treat the cancer, or improve my symptoms, or both? What are the side effects? How brutal will they be? These are the most common questions cancer patients ask. Oncologists cannot inform patients on alternative to their treatments not only because they do not believe in them but also because they risk losing their right to practice medicine if they fall out of line with the lockstep thinking of pharmaceutical oncology. I am available for consultation on all the issues presented in the Surviving Cancer Compendium. Cancer patients who purchase the compendium are eligible for discounts on consultations and get the compendium without charge if they join the online clinic. About Orthodox Treatments – Oh No! Why Are So Many Children and People Getting Sick? Should You Trust Your Oncologist? Do Cancer Tests Test for Cancer?